Are You the Leading Landscaper in Your Home Town? Watch the video to see if you could qualify for $6000 in FREE lawn equipment. Only TWO openings left, apply today! Beta-testers receive $6000 worth of FREE battery powered lawn and landscape equipment! Watch the video! Are you ready to become an industry leader? Take your lawn and landscape company to the next level and become a beta tester today! The video above describes exactly how you can receive FREE battery powered equipment valued at $6,000! If you make your living mowing lawns, maintaining landscapes or providing gardening services for residential or commercial properties, you’ll be glad you found this message. New battery technology will make your jobs go easier than ever AND lower your cost of providing lawn services, putting more cash in your pocket. This is powerfully good news because it seems that lawn and landscape contractors have been under attack from outside forces. First, many customers and even more prospects think of you as a commodity. They judge you based on LOW price. It’s tough to make a healthy living landscaping when you’re being judged solely on price. You need a way to separate yourself from the competition. Profits can be three to five times greater when prospects select your company because you provide quieter and greener lawn service than your competitors. New battery technology can help you do it! Second, local governments have declared WAR on noisy lawn and landscape equipment operators. At the time of this writing, over 500 municipalities have placed outright bans or reduced service hours for contractors using gas-powered lawn maintenance tools like back pack blowers. This makes the job of providing a lawn service tougher than ever. You’re going to need a way to provide quiet lawn services in many communities in order to stay in business! Third, finding employees willing to work outdoors with their hands and equipment is challenging. It’s hot when you work outdoors in the summer sun. It’s cold when you work outdoors in the winter. Many lawn companies offer seasonal jobs that may not suit young workers. Further, it seems the younger generation doesn’t have the mechanical experience of our fathers. As lawn service contractors, you’ll need a new strategy to attract employees and keep them engaged. Fourth, there’s this growing debate called “global warming”. That is, some science of today says that operating internal combustion engines is harming our environment. Some believe that if we do not stop using fossil fuels, we’re bound to destroy our planet. There are reports that claim gas-powered lawn equipment pollutes at rates that exceed automobiles. So federal governments are mandating strict rules regarding emissions of equipment and vehicles. Regardless what you believe, gas-powered equipment costs are rising in response to government emission standards. My name is Tony Bass. I’m the founder and CEO at Super Lawn Technologies. I need to share a tiny bit of background. Growing a lawn or landscape company seems risky to some folks. But not us. You see, since 1987, we’ve been making an exceptionally profitable living providing low-tech services like lawn mowing, landscaping and garden care. With dirt under our finger nails and a red neck from too much sun, we understand the challenges you face everyday as an owner of a lawn service business. Our inventions inside our lawn business led to the start of a manufacturing company. Since 1998 my lawn equipment manufacturing business has quietly taught over a 1000 landscape companies how to ramp-up profits without taking unnecessary risks. Our client relationships are our most valuable asset. For those who truly know us…they know our love and respect for lawn and landscape business owners is our passion that inspires creative problem solving. We believe the four challenges covered above can be overcome using new technology. Three decades of landscaping experience has taught us that being an early adopter of new technology creates an instant advantage in the marketplace. We’ve profited from the early adoption of equipment, software, communication tools and web technologies years ahead of most. Then we watched the nay-sayers and non-believers in the “new tech” get crushed time and time again. Losers get “stuck” in the old ways. They fear change. One day they wake up and find themselves in a struggle to survive. Many never saw what was coming even though the changes were in plain view. We don’t want this to happen to you! That’s why we’re sharing $250,000 of research and development right here on this website. We want you to be one of the early adopters who enjoy 3x to 5x better profits than the average lawn guy. Unfortunately, most lawn business owners will ignore our message. But a few brave souls will listen and profit greatly. We don’t want you to fear new technology. We want you to embrace it, profit from it and deliver the lawn services your customers need, at the lowest cost possible! Today, you have a choice. You can kick the habit of buying gas-powered lawn equipment and switch to battery-powered equipment instantly lowering your energy cost. That’s pretty cool! When you discover that select models of battery-powered lawn equipment are just as powerful and just as productive as gas-powered equipment, you can change your fuel! You move away from petroleum-based fuel and you move to cleaner, cheaper electrical power. Buying energy from your local utility is cheaper than buying gasoline per unit of power. Way cheaper! And… Energy that is captured directly from the sun using solar panels is FREE. This is a game changer! Lithium battery technology allows us to store more power than ever in smaller packages than ever. From pacemakers to cell phones, to automobiles, to lawn equipment, lithium battery technology is changing the world. This energy storage technology is quietly taking market share from fossil fuels. Some call it the Lithium Revolution! There’s significant upside to switching from gas-powered to battery powered lawn equipment. Battery-powered lawn equipment operates at about one half the decibel levels of gas-powered equipment. It’s much quieter! This means your employees have a more enjoyable work experience. Battery powered equipment has zero emissions and NO smelly fumes. This is a huge benefit to those employees who use equipment daily. And its gets better! Equipment without pull cords, carburetors, spark plus, fuel filters, air filters and leaky gas caps don’t require nearly as much service. This means lower cost of ownership via lower maintenance costs! Many of these tools are lighter in weight than comparable gas-powered tools making lawn maintenance and gardening work less physically demanding over an eight-hour shift. These tools are so easy to use, you’ll find a wider range of employees to fill the jobs in your company. The lawn maintenance industry has long faced challenges of mobilizing people and equipment from job to job in an efficient manner. Pick up trucks and trailers are used in most lawn service companies today. But many lawn business owners have discovered an alternative. All-in-one work trucks that eliminate towing and instantly provide a secure equipment warehouse are easier to operate than trucks plus trailers. Super Lawn Trucks’ patented technology was introduced to the lawn industry in 1998. They remain the undisputed leader manufacturing highly customized work truck bodies, loading ramps, tool storage and operational systems for the lawn service industry. Since this company uses a direct-to-buyer sales system, they offer the most affordable lawn trucks, landscape truck bodies and accessories available in the USA. 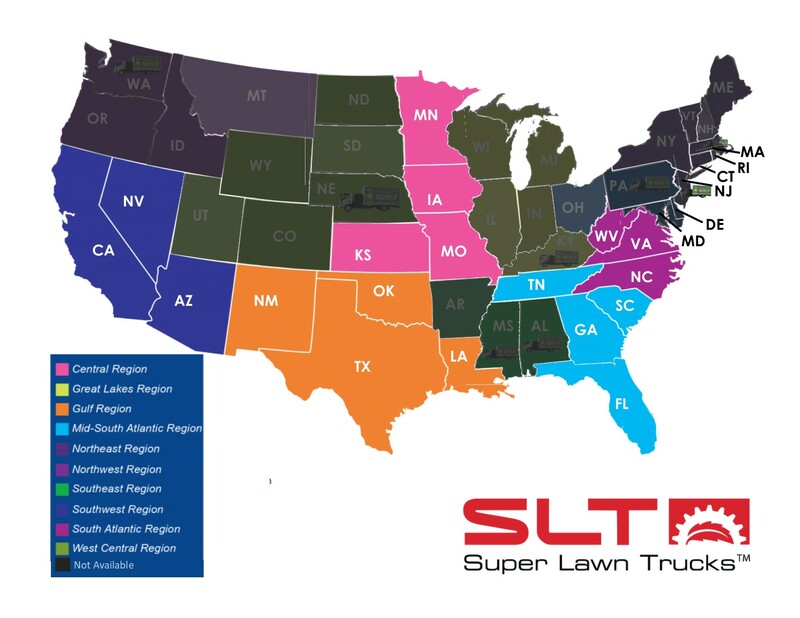 Simply stated, they are the ONLY truck body manufacturing company in the USA that invest 100% of its resources to serve the lawn and landscape contractor. So, it makes perfect sense that Super Lawn Trucks would be the first company to clearly see the need to help facilitate this shift from gas-powered lawn equipment to battery powered lawn equipment. We exist to help landscapers succeed! That’s why we created the Mobile Solar Powered Charging Station. Think of this as your very own power plant on wheels. Sustainable power generation built in (and built onto) a truck and truck body designed specifically designed for battery powered lawn care. We call it the Solar Lawn Truck. Would this Plan Be Right for Your Lawn Company? Super Lawn Trucks didn’t invent solar cells, lithium ion batteries or battery powered equipment. But our company will help the landscape industry adopt these technologies with the project we call the Solar Lawn Truck. We intend to work with a handful of well-qualified lawn maintenance contractors who agree to be part of an introductory beta-test group to prove this concept works and transforms the lawn service industry to a cleaner, greener and quieter industry. Along the way, we believe the companies that participate in the beta-test introduction will develop several advantages in the marketplace. If you would like to apply to participate, click here. There are a handful of territories available. We know that most lawn and landscape business owners are NOT early adopters. The thought of making big changes to the way they service their customers sounds risky. So, we expect the majority of lawn and landscape business owners to take a wait-and-see approach. We understand this. To date, we have invested just over $250,000 to make certain this approach is going to work. We’ll be doing MUCH more over time. If you want to continue to monitor the progress of the beta-testers and gain access to our published research, click here to get on our “Insiders Club” mailing list. If you own a lawn service or landscape contracting company, your future is up to you. You have three options right now. Choice #1: You can adjust your business practices to develop an instant advantage. Become a beta-tester while there are significant incentives to do so. Your status as an industry leader will be secured while you adopt a lower cost business model. Apply to become a beta-tester for the Solar Lawn Truck project here. Choice #2: Recognize your need to study this topic further. Join our mailing list so you can stay informed on the latest developments on battery powered lawn equipment, published research data and case studies regarding the adoption of the Mobile Solar Powered Charging Station from the field. Learn more here. Choice #3: Ignore this message and stick with the operational practices of the average players in the industry. Continue to live with loud, smelly equipment that often needs expensive maintenance and repairs. Keep dragging trailers around and fighting the battle for “experienced employees”. We expect the majority of contractors to do this. But that’s ok.
Changing the lawn industry may take some time. We’re prepared to help make this a reality. Tony Bass is the founder of Super Lawn Technologies. He is the co-author of The E-Myth Landscape Contractor: Why Most Landscape Companies Don’t Work and What To Do About It. You can contact Tony at Tony@superlawntrucks.com or 866-923-0027. Beta tester programs are no longer available in areas marked in black. Beta testers are needed in other colored areas.